Wow. This story is proof that primary reporting is important and that I should never “assume.” For years, I have known about Ceco Sinks — but looking at their website I had assumed that they were manufacturing their sinks — all porcelain enamel on cast iron — for Kohler and other companies. Well, an email from reader Sarah prompted me to finally call them and argh, I learned that they are actually competitors — yes, they are another source altogether — for cast iron bathroom and kitchen sinks. And importantly, and the subject of this first story about the company and its products: They make two designs of metal rim — aka hudee ring — bathroom sinks that include both 4″ and 8″ spreads for the faucet. 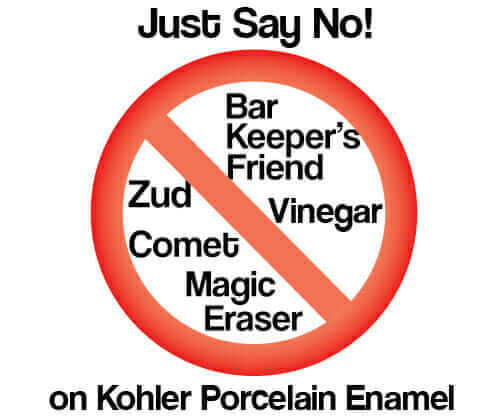 This is important news to Retro Renovators, because Kohler recently discontinued the 8″ spread on their similar Tahoe model, leaving those of us who prefer an 8″ spread with only vintage options to consider. 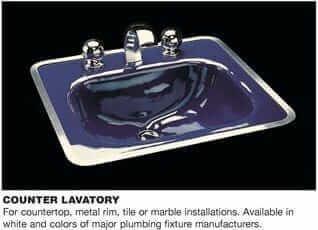 The two Ceco bathroom sinks you want to look at are under the “Lavatories” section of their website“. Above: The #580 and #581 Maui sink — one model number is for the 4″ spread, the other, for 8″ spread — read the details. 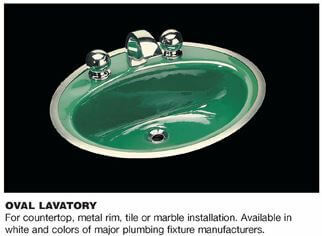 Kohler makes a sink similar to this — their Tahoe — but today it is available only with a 4″ spread. Above: The #578 Kauai — looks like there’s just one model number (?) 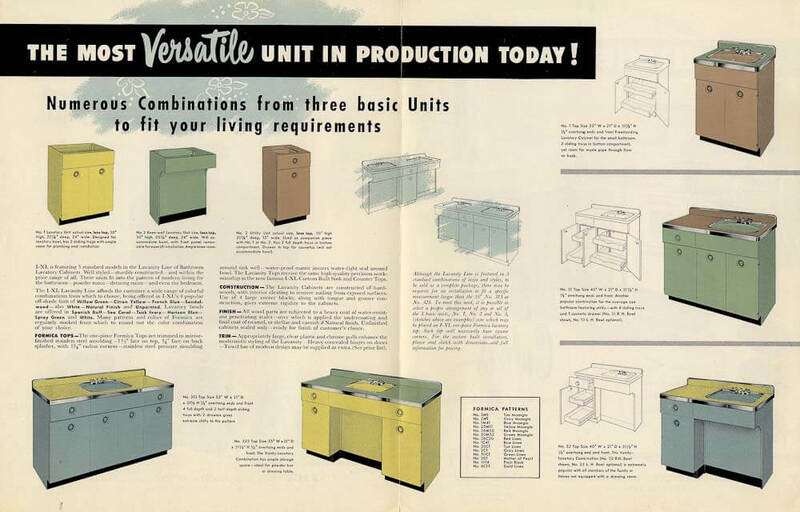 — be sure to specify 4″ or 8″. Like their other products, Ceco’s two hudee-rimmed bathroom sinks come in six colors: White, biscuit, almond, bone, black and platinum (similar to Kohler’s ice grey, Ceco told me). Alas, prior to 2009, Ceco offered up to 50 colors. But the Great Recession and related factors forced Ceco to streamline their product line. 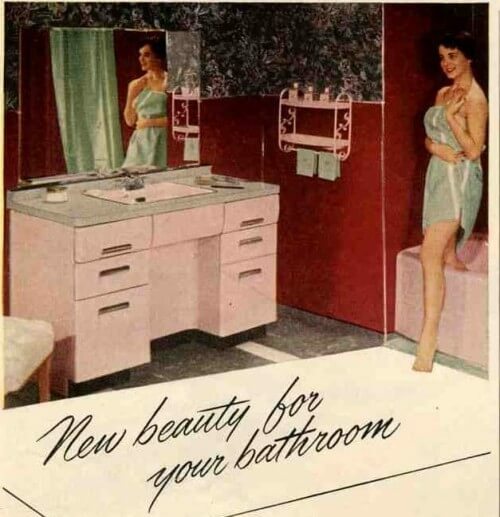 Even so, it’s great to have these two bathroom sink options available — especially because it’s also difficult today to find a good, retro-styled 4″ spread faucet. My favorite option for an 8″ model is the 8″ Mississippi bathroom faucet from Strom Plumbing — their 4″ model is no longer available. I used the 8″ Mississippis in two of my bathrooms, I love them. Ceco Sinks is a wholesaler — they do not sell directly to the public. To order one of their sinks, try a local plumbing supply store (not a big box store, though) to see if they can order the sink for you. If you have any trouble, call the company, and they can direct you to the nearest regional distributor. Important additional news: Ceco has five designs of porcelain enamel cast iron kitchen sinks with hudees, too. Read my story here. 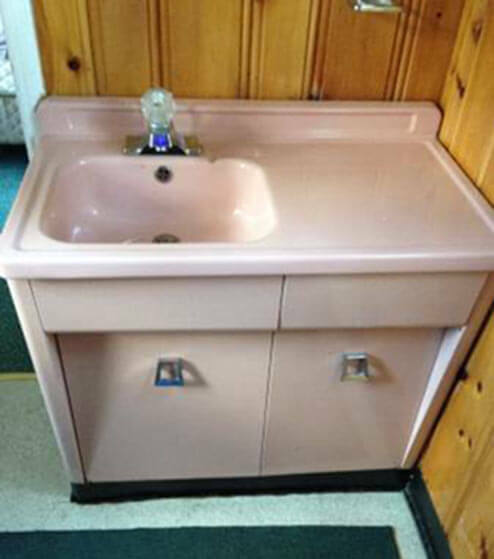 Rare 1950s Shirley steel bathroom vanity — and with a drainboard sink! Thank you for the informative article and comments. Hubby and I moved into a wonderful 1957 ranch one year ago, and we promised ourselves to live here without making changes for a while. I am so glad that I did, because now I adore EVERYTHING about both of our bathrooms (all original except lighting and towel bars). The only problem is that one of our original cast iron bathroom sinks has corrosion and rust in the “apron” piece underneath the main basin. So it doesn’t look like it leaks, but it leaks slowly underneath (where it cannot be seen) and winds up on the bottom of the cabinet. I am reluctant to buy a replacement if I can repair the original. Has anybody ever repaired one? I would love some suggestions, as we are new to the world of mid-century renovations. Thanks! I am in the process of getting a nice retro house in Cincinnati. I had a plumber come in to give me quotes on getting things back up and running as the house has sat empty with the water off for aprox 10 years. The facets in a jack n jill bathroom are what he is calling Crane DialESE ?? he said parts are not available if the valves are bad or the pop up drains.